I got a couple of close gamer friends together for an impromptu game day at my house. We warmed up with Die Aufsteiger/The Climbers. We quickly moved on to Power Grid. 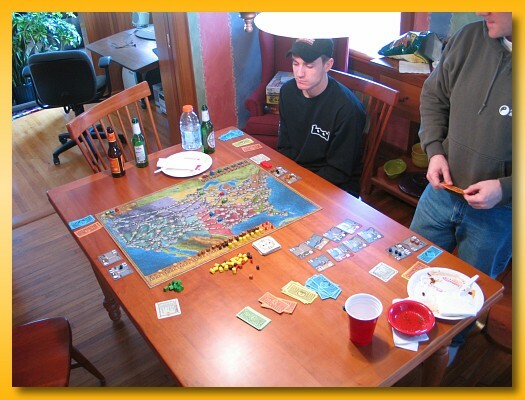 Power Grid is an economic, route building game of supplying power through a network of cities on a map. Players bid money for auctioned power plants that require different types and numbers of resources to operate (coal, oil. trash, nuclear, wind). After acquiring power plants, players must purchase the necessary resources to operate them from the market. As resources are purchased, they become scarcer and therefore more expensive. Additionally players build upon a network of cities that their power plants supply. The only way to obtain more money, is to power the cities in your network at the end of each turn. 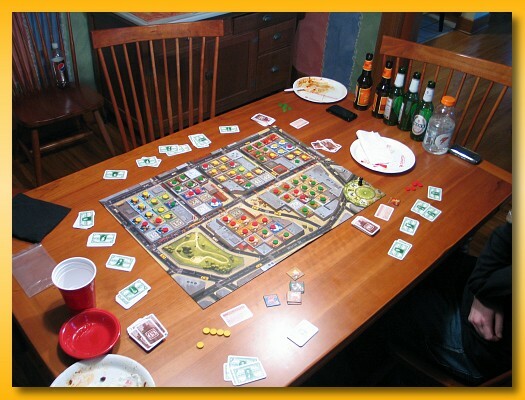 When the game ends, the player that can power the most cities on the final turn is the winner. I’m not a big Power Grid fan though. I owned a copy and we’d tried to play it numerous times but could never make it through the entire game in one sitting. The first step of the game (up to 7 cities) is relatively straightforward, but the second and third steps get a bit fiddly with the power plan auction market. There isn’t quite enough meat in the first step to make it a “real” game but I don’t enjoy the last two steps so I’m in a quandary. I enjoyed playing it more with only three players rather than the full complement of players. It moved along at a faster pace but I’m still glad I traded my copy away. Next up was Chinatown. The game was new to all of us so it was a learning game. I’m not fond of negotiating games and to do well you have to be able to see what’s worth negotiating for and how best to value that position on the board. I ended up winning but I don’t think that had much to do with my skill at the game. Players draw cards and from that set keep a few and discard a few. The cards depict numbers that indicate where on the grid (Chinatown) you can place a “control” stone. Players place their stones on the numbered squares for the cards they keep and then everyone draws tiles blindly from a bag. You job is to try to collect and or negotiate for trades and/or controlled positions on the board such that you can lay identical tiles in groups. The tiles represent types of businesses being built in Chinatown (e.g. Laundry, Restaurant, Fish Market, Tea House, …) The larger your establishment gets, the more points it’s worth at the end of the round. I enjoyed playing the game well enough but not enough to seek out a copy for my collection. I can’t believe it but I forgot to take a picture of our game of Cavum so all you get is a bogus box shot I took a few days ago. 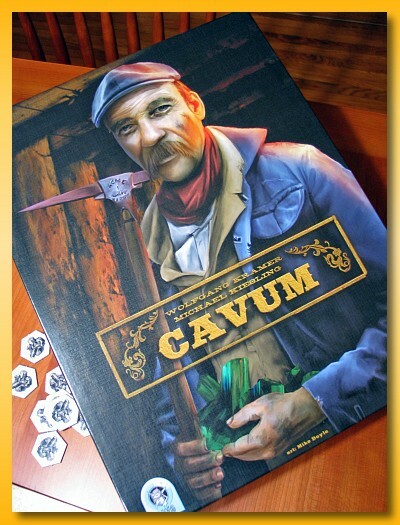 Cavum is a brand new (thanks BGG Secret Santa!) title from my collection and I’d only played through a sample solo game. In Cavum, players did tunnels into a central mountain looking to “uncover” loads of gems. Players place tunnel tiles deeper and deeper into the mine and build stations that block travel through the tunnels for other players. The goal is to collect the right kinds of gems during a traversal of tunnels between two stations. Tactical placement of stations, blocking players, destroying tunnels, and connecting to the cities that surround the mountain are critical. The game can be rather cut throat since players can place dynamite tiles that blow up tunnels and they can place tiles on top of existing tile to reroute the tunnels for offensive and defensive purposes. I liked the game but there are a lot of moving parts and things to think about. Our final game was Notre Dame. October 2007 was the last (and only!) time I’d played. It’s been to the table a few times in game nights where we’ve split into two tables but I’ve always been at another table. I was happy to play it and really enjoyed it. I really need to get this game to the table more. Notre Dame is somewhat of a solitary endeavor. Each player is assigned a lobe of the city with Notre Dame in the middle. 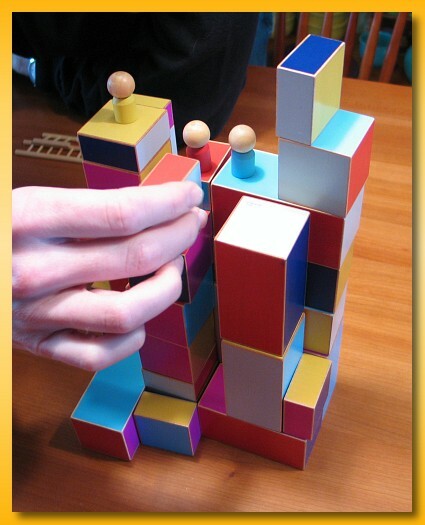 With one exception, your play is limited to placing cubes into boroughs of your section of the city. You place cubes and a pawn (your trusted friend) into individual boroughs pay playing cards from your hand. Each borough affords you different actions to perform and the more items you have in the borough the more powerful that action gets. Players interact in a few ways passing cards to each other, vying for dominance in Notre Dame, and moving a carriage around the city. You’re all trying to earn victory points but you’ve got to deal with the plague-ridden rats that attack at the end of every turn. I really enjoy Notre Dame and it’s a shame it’s been so long since I’ve played. Thanks for coming over for the impromptu session and I hope to do it again soon. Okay, it was an impulse buy but my copy of Die Aufsteiger, a.k.a. 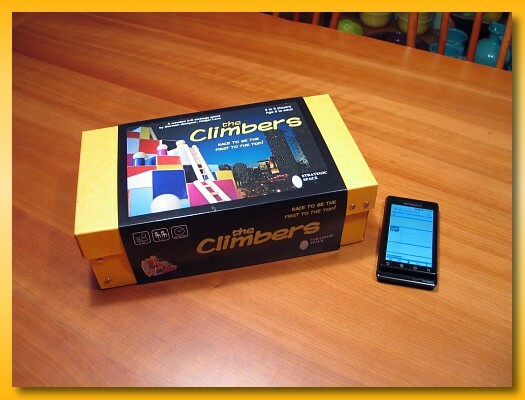 The Climbers, arrived today. I was surprised that it came so quickly given that I’d only ordered it on Friday morning but by Monday afternoon it was sitting on my porch, packed well in a USPS Priority Mail box. The game is heavy, weighing in at 4 pounds 6 ounces; you don’t want to drop that on your foot! 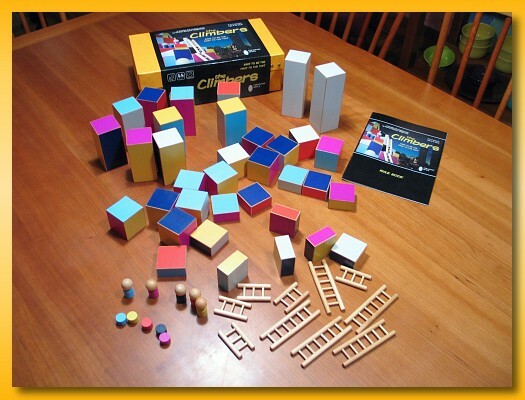 The shoe-boxed sized box, shown next to my phone for scale contains chunky wooden blocks, five wooden “climbers”, five blocking “stones”, and ten ladders (in two sizes). 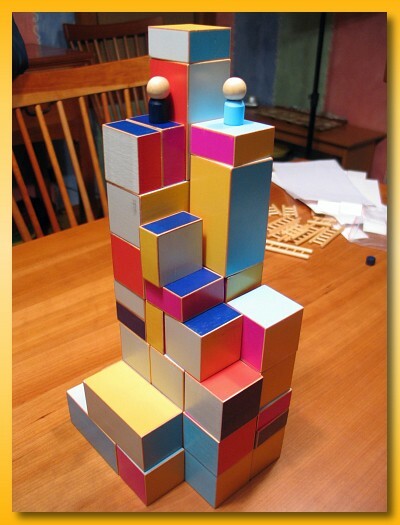 You begin the game by placing two large gray blocks vertically and then everyone simultaneously places blocks around them following a few simple rules. 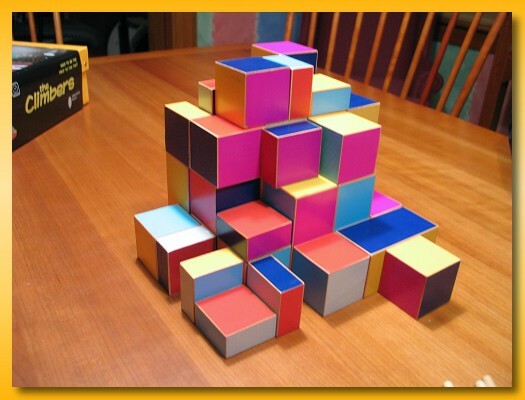 When all the blocks have been placed, the two gray starter blocks must be completely hidden. The image above was the arrangement Noah and I arrived at for our first game. 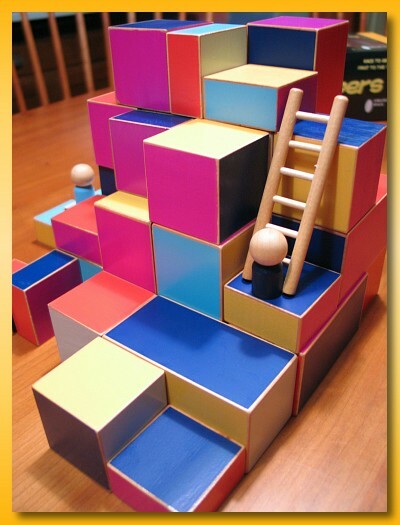 Players take turns optionally moving a block and then attempting to climb their “climber” up the block mountain following a few relatively simple rules concerning what colors you can climb on, how many climbers can stand on each block, and limitations on how high of a block you can climb upon without using a ladder. Ladders are only good for one use and are removed from the game. Each player gets a single small and a single large ladder so use them wisely. The game ends when during a turn nobody moves to a higher level. The player at the highest level wins or in the case of a tie, the first player to reach the tied level wins. There are optional minor modifications to the end game rules when playing with two. Since the set up is random but still carried out by humans, you might think there would be cause for making sure nobody is stacking the deck, pardon the play on words, by placing blocks in a fashion to make it easier for their color. However, that’s taken care of by the fact that you don’t know what color of player you’re going to be until after the initial set up. Noah and I had fun. It’s a light but interesting mental puzzle, good for an opener or closer or with light gaming company. I’m interested to play it with more to see how that plays out. It’s a very photogenic game and I hope to try to get some artsy-fartsy shots in the coming weeks. I honestly can’t believe it but my image above won the BGG contest for the 2009 Picture of the Year. Last year there were 195,895 new images uploaded, 1.3 million new forum posts, 11 million unique visitors, and 291 million page views. Board gaming is a relatively niche hobby but with numbers like that I feel like a small fish in a big pond. Having no training in photography, if I can win, anyone can win. Thank you for all the votes, good luck to all of you in the ongoing monthly contests, and in the year end contest for 2010. Rarely do we plan ahead of time what we’re going to play on any given game night but this night was different. Jared had checked out a copy of Battlestar Galactica from the CABS library and we knew a week in advance what was coming. I never followed the BG television program and have seen no episodes of BG – The Next Generation ™ but I’d heard that it was not necessary to play the game. However, I did watch a short boardgameswithscott video on playing the game and felt I was up to the task. For my group, BG is a long game. Epic long. We just don’t play games like it but we wanted to play it at least once. We routinely overshoot the listed times on the boxes by 50%-75% and BG lists at 3 hours. Yeah…epic long. So, add in a lengthy rule reading and we were in for a long night. A “school” night mind you. As luck would have it, the weather turned bad and the snow and ice-bound traffic snarled up most everyone by 15-20 minutes. I’d wanted to get in one playing of my rethemed DYI copy of Scripts and Scribes and although we had 5 I taught the game to the other four and sat out while they played. So, by 8pm we were ready to start in on BG. When the initial round of loyalty cards got passed out, I found it difficult to contain my elation at receiving a Cylon card but I did my best to act human (I don’t think Cylons make giddy noises like a little girl.) We made our way through numerous failed skill checks and I only poisoned the deck with one card a couple of times. On my turn I attempted to help soliciting input from everybody, grumbled when my attempts at helping would fail, acted suspiciously towards others as if they were Cylons, and in general not trying too hard to sabotage anything. I sat back and bided my time. I was the engineer and I wanted badly to use my one time game power of choosing one color during a skill check to ruin its value but the opportunity wasn’t presenting itself. The known Cyclon placed the Admiral in the brig and on the Admiral’s turn he, with a skill card, granted me (on his left and with complete confidence in me as a human) the ability to take a turn. This was the perfect time for me to out myself as a Cyclon since I’d get two back to back turns with Cylon capabilities. 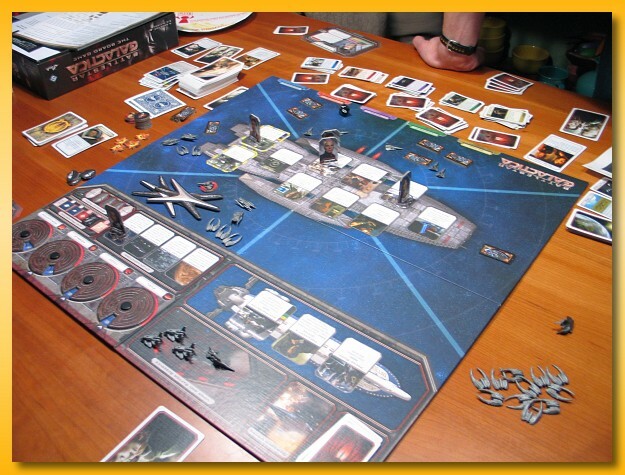 To make matters worse, the player to the Admiral’s right was the other Cylon so we’d effectively have three Cylon turns in a row. But, I was blinded by my desire to sully a skill check with my engineer’s power and I again didn’t grab the brass ring and took a turn that ended innocuously. I was about to take my regular turn and out myself when the question came up about terminating the game. The humans had only 1 distance point under their belts, the outed Cylon had done a good job of pulling down the population value, there were lots of ships ready to do some damage, they weren’t close to jumping, and we were roughly 3 hours into the game. So we decided to fold up shop. Jared picked up the loyalty deck was about to pass out the rest of the cards to see who “would have been” the other Cylon and I announced that it wasn’t necessary since I was the other Cylon from the beginning! A huge groan arose from my living room…a complete surprise. Man, I wish I would have outed myself when the Admiral let me take that turn. BG is a fun enough game but the fun was really being generated from the camaraderie among my gaming friends. Sure, the game established the scaffolding for it to take place but in retrospect, the mechanics of the game are not all that interesting. Since I’m not a fan of the show I miss out on the subtle (and even overt) ties back to the theme and the game itself boiled down to card play and plastic ships. I’m glad I got a chance to play. I had fun but I don’t see a need to play another game to the finish to feel complete. I’m happy with what I got out of it and I feel comfortable moving on. We lost a player to the ice and snow and finished up the night with a round of Scripts and Scribes for four. Thanks guys for coming over. I had a lot of fun being a toaster. Few games trigger extremely visceral negative reactions in me but after only a few games of Wasabi, I’m content with never playing it again. I give the game high marks for component quality. The tiles are thick. The bowls and wasabi cubes are an excellent thematic addition. The choice of little menus to hold the recipes, clever. However, my frustration during each game multiplied faster than noodles made by a world renowned master dough stretcher. Wasabi’s theme pits players against one another in attempts to complete sushi recipes of various complexities (number of ingredients). 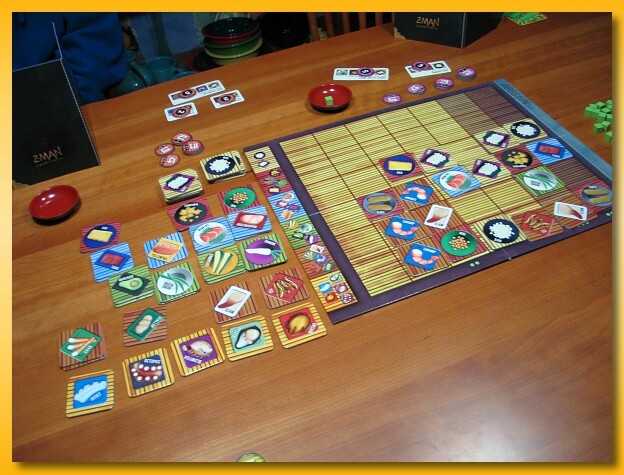 Players gather ingredient tiles and place them on the board in rows and columns trying to create lines of ingredients that match hidden recipes. 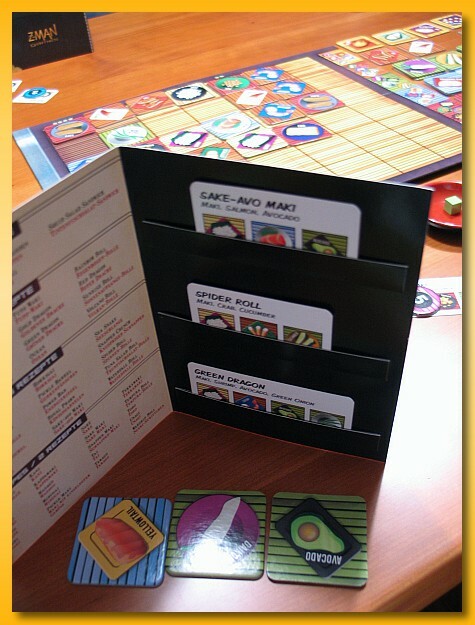 Each player has a “menu” that is used to both conceal three recipes (taken blindly from a common pool) and three ingredient tiles taken openly from the “pantry”. A turn is composed of placing an ingredient tile (optionally playing a card) and refilling your hand of ingredients back up to three. If you’ve completed a recipe you remove the recipe from your menu and assign an appropriately sized token (according to the number of ingredients in the recipe: 2-5) to it earning victory points. All players start the game with the same mix of victory tokens and you’re only allowed to complete recipes of a given length if you have a token of appropriate size left. 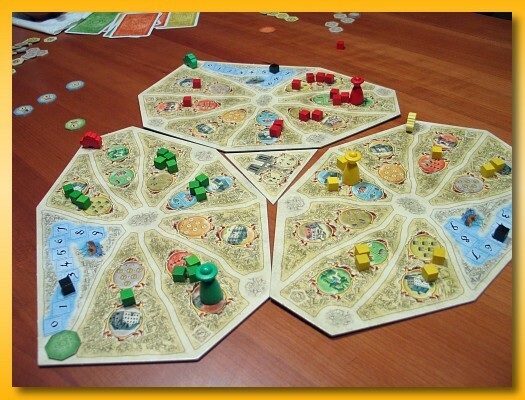 The game ends when no more tiles can be placed on the board. If the line of ingredient tiles is in the exact order as that shown on your recipe card, you not only get the victory points for the recipe but you also receive an appropriate number of green wasabi cubes placed in your bowl for completing the recipe “in style”. The larger the recipe, the more difficult it is to complete it “in style” and therefore the more wasabi you cubes you win. Each wasabi cube counts as one victory point. There is a strict order to refilling your hand after completing a recipe. The AIR rubric reminds players of that order. A – Action Cards. You’re allowed to take one action card for each recipe you’ve completed on your turn. There are 5 types of action cards available in limited numbers: Spicy, Switch, Stack, Chop, and Wasabi. I’ll describe these later but you’re allowed to keep up to two behind your menu. On your turn you’re allowed to play one in addition to laying your ingredient tile. I – Ingredients. You must take as many ingredient tiles necessary to get back to three. The ingredients are placed face up next to the board in the “pantry” and you’re free to consult your remaining recipes to make an informed decision. R – Recipes. You must take as many recipes as necessary to get back to three. The recipes are taken from a face down common pile separated by length. You have no idea what ingredients will be required to fulfill the recipe you choose but you can freely choose the complexity level. So what are the action cards used for? 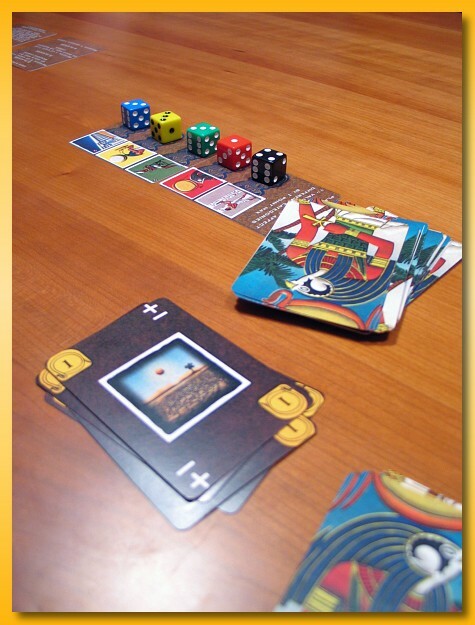 A normal turn calls for the player to lay a tile and then AIR and the action cards allow you to break the rules. Most cards are played back into the common pool and becomes available for another player to take when they complete a recipe (you’re not allowed to pick up the same card you played when performing your AIR at the end of your turn.) Spicy lets you place an additional ingredient tile. Switch lets you swap the contents of two orthogonally adjacent cells on the board (one cell can be empty.) Stack lets you place an ingredient tile on top of an existing tile and therefore occluding the tile underneath. Chop lets you remove a tile from the board (and potentially exposing an occluded tile.) The Wasabi card is placed on the board itself and occludes up to four cells. This effectively blocks further placement of tiles in these four cells, prevents any player from fulfilling recipes that use the tiles underneath the card, and hastens the game end since it can be placed over empty cells. As a bonus, the player of the card gets a green wasabi cube. Note also, that the next player to complete a recipe is free to choose the Wasabi card placed on the board thereby removing the “block”. Those damn cards. It’s all about the damn cards. Every time I’ve played I’ve worked and worked on multiple recipes but it never failed to amaze me the knack that other players have for inadvertently messing up my plans by chopping out tiles I needed, or switching two cells, or stacking on top of a tile I was relying on, etc. I don’t mind games where players actively attack other player position but having to repeatedly take my lumps as just a mere side effect of players all trying to mitigate the chaos of the ever tightening board is just too much to bear. On more than one occasion I was poised on the following turn to complete one or two recipes only to have it thwarted by card play. If you don’t have cards, you need to complete recipes to get them…but in the latter half of the game you’ll be hard pressed to complete anything without using a card. It’s a catch-22. If you’ve gotten thrashed by card play and you need to trash your recipes (you can always forego your turn and throw recipes out and pick up more) you’ll be at the mercy of the blind draw and you may very well find yourself in just as bad a shape as you were at the beginning of your turn and nothing to show for it. I love the look of the game, the artwork is fantastic and the quality of the components places it solidly in the top tier of games but the chaos killed it for me. I don’t find it fun to take my lumps or give out lumps inadvertently and I find myself incapable of playing it in a light/filler game mode where the game is more of an activity than a real game. You have to think very tactically to play even remotely well but it’s just not worth it for me. Up for trade. Lisa bought me a copy of Race the Wind back in May of 2007. We’d played it once as a two player after slogging through the utterly horrific rules and could feel the game in there but we had so many questions. Lisa really liked it and we’ve never had a chance to play it with more than two players (which I still really want to do). I’ve had it up for trade for quite a while but my trade interest is low. I’m convinced it can be a good game. So, last night we decided to pull it out for another go. As I mentioned previously, the first hurdle is the incomprehensible rules filled with typos and the inconsistent use of the same word to mean multiple things. For example, boats can do two things: move and maneuver (turn without changing their position on the grid). On your turn you take actions. However, sometimes the rules describe actions as moves and/or turns. So when the rules state “after your move” are they referring to movement or action? As if that isn’t enough, they sometimes use phrases like, “the boat proceeds” to indicate movement on the grid and at other times leave other situations completely out of the rules. I suspect the rules were either translated poorly or written by someone who sails and at the expense of being pedantic, left out the “obvious” and “common sense” things sailors do ensuring only partial comprehension. The second hurdle is the nautical jargon. Bowline, tacks, gybes, broad reach, beam reach, starboard, port, stern, bow, capture, shadow, priority, etc. are not in my normal vocabulary but you’d better get used to them because you’ll need to understand how the wind direction (which changes 12 times in a two-player match race) affects your abilities and how to select what you can do on your turn. 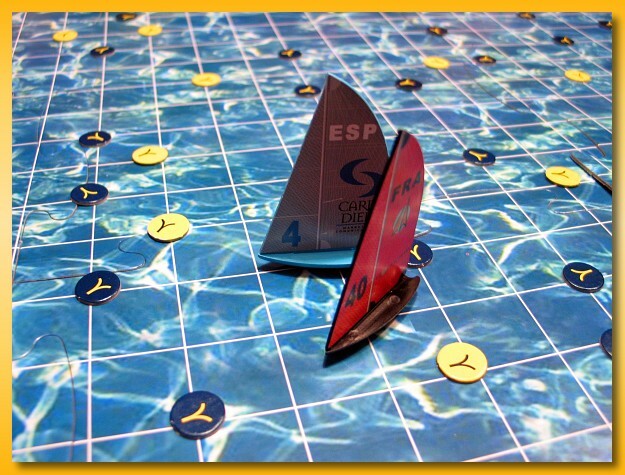 The game attempts to capture true regatta rules in a board game and from what I understand from people who know something about racing, it does a very good job. I’ll describe the setup for a two-player match race since that’s the only type of game I’ve played but not much is different for more players beyond the starting conditions and the level of interaction during the race. The huge board is assembled and a buoy is place on the same horizontal grid line with the commission boat separated by some randomly chosen number of grid lines, somewhere near the bottom of the board. These two items form the downwind starting gate. At some point near the top of the board, another buoy is placed representing the upwind buoy. Boats make three trips up to the upwind buoy proceeding clockwise around it and three trips down through the starting gate (between the buoy and commission boat and turning clockwise around the buoy and anti-clockwise around the commission boat, basically to the outside of the board, depending on which object you wish to turn around as you make your way back north). Two wind flags are positioned along the long side of the board (between the buoys) and represent two horizontal grids lines that, when crossed by the lead boat, triggers a roll of the die which sets the wind direction (most likely changing it) until it’s crossed again. The start of the race requires boats to maneuver and move through a series of seven turns before being allowed to cross the starting line. Boats are allowed to start above the starting line but they must first cross it heading south, maneuver, and then come back north. There are additional rules concerning when you’re allowed to touch the starting line, how long you can sit (maneuvering) on a single node of the grid, etc. Eventually, the race starts and every boat is heading north against a wind from the north. The regatta field is littered with yellow and blue tokens which affect the rate at which the boats travel between the buoys. Yellow tokens represent falls and cause the boat to terminate a turn early if reached mid-turn AND cause the boat to skip a turn in the following round. Blue tokens represent gusts which, when reached, trigger an optional additional movement on the grid. The actions available to a boat are determined by the wind direction in relationship to the position of the boat. There are four ways in which wind can strike a boat: bowline, beam reach, broad reach, and downwind (you’re not allowed to position your boat directly into the wind). Bowline positioned boats are traveling at a 45 degree angle into the wind and are allowed to move one grid space or maneuver on the same space either into a beam reach or broad reach position in one direction (45 or 90 degrees) or into the opposite bowline position (the other side of the 45 degree angle upwind) by tacking the bow 90 degrees through the wind. Beam reach positioned boats (boats at 90 degrees to the wind direction) get two actions and can move and/or maneuver on each action. Broad reach positioned boats (downwind at 45 degrees) must move first but then get an optional maneuver. Directly downwind positioned boats can choose to move or maneuver. Although smart navigation by avoiding yellow falls and taking advantage of blue gusts is important, the meat of the game is really the interactions that occur between boats. There is a priority order that occurs when two boats vie for the same position on the grid or a boat wants to move into an position occupied by another boat. A boat’s relationship to the wind (starboard or port) and its position relative to the other boat and the wind (windward or leeward) determines which boat has priority over the contested position. If a boat lays claim to a contested position and doesn’t possess priority, the other boat can call a penalty that the other boat must pay before the end of the race. Each penalty is paid by the boat performing a 360 degree maneuver through 4 successive turns (ouch!). There are other rules affecting the priority ranks when boats are within two grid positions around the buoys when making turns, boats in the wind shadow of other boats, capture rules when “catching up” with a boat from the stern, etc. that are the real keys to controlling and taking advantage of the player interaction. The game is still fun with two but with more players I can see how outsmarting other players by making them pull up or maneuver when you have priority can make or break the game. As it stood, Lisa won by one boat length after our three lap match race. The abrupt wind direction changes when passing the wind flags weren’t particularly devastating to either of us since we were always within a boat length or two from one another and in many cases, traveling the same wind-line and therefore affected equally. There is a game in there and I’d like the chance to play with more. However, it does sit on the shelf a lot and without regular play, it does take some effort to relearn the rather esoteric rules of engagement.